Most rug manufacturers use in-house designers or purchase designs outright. However, some do license art for their smaller size accent lines. 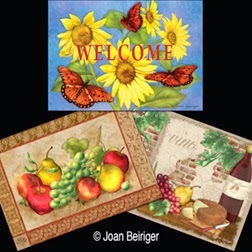 Many that manufacturer décor flags also license art for doormats, and a few manufacturers license art for all the rugs and mats they produce. Rugs can be made numerous ways but the ones that are produced for the mass market are either woven on looms or needle-punched on heavy fabric with various kinds of fiber (wool, cotton, silk, nylon, etc.). Rugs that are made with looms are limited in the number of colors that can be incorporated into the design depending on the coarseness of the fibers. The designs on needle-punched rugs are either made with colored fibers or printed by dye sublimation printers. The printing technology allows a larger variety of colors to be used than by using fibers. Many rugs are handmade on looms and needle-punched in India, China, Persia, Turkey, Tibet, etc. There are also factories that use automated looms and machines to produce rugs such as Axminster Carpets in England, and Mohawk Industries in the United States. View "Axminster Carpet Manufacturing" and "Made in Dalton: Mohawk Industries" videos to see how they make their rugs. Floor Mats (including door, bath, play, etc.) are usually made with fibers by the needle-punched method, or with vinyl, rubber and other materials. Designs are painted on the mats with a dye sublimation printer. To see how needle-punched mats are manufactured, view "Custom Mats Productions" video. 1. 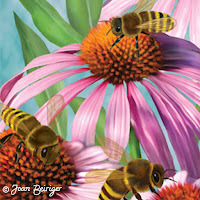 Check out manufacturers website to see the art on their rugs and mats, submission guidelines, and contact information. If the site is password protected, search the internet for internet retail stores that show their products. 2. Make sure your art fits the manufacturer product line. Not only does the art need to have themes that will sell the manufacturer rugs and mats but the colors and art style needs to also work. For instance, if the manufacturer uses coarse colored fibers for their mats or rugs then the design needs to be very simple without using many colors to shade the images in the design. As an example, check out Jellybean Rugs website. The designs they license are simple and has very little or no shading. If a dye sublimation printer produces the design on the rug or mat, more colors can be used. But, you probably are still limited to how many depending on the capability of the printer. 3. A horizontal format of the art is most often used for mats and accent rugs. So, make sure the images are in a horizontal format before submitting them to the manufacturer. 4. Not all manufacturer websites list submission guidelines. Contact the person in charge of licensing art for each manufacturer you wish to submit art. Ask how she/he wants art submitted (hard copies, jpg copies attached to an email, etc.). It also would be wise to find out the limitation on the number of colors that can be used and if they require you to submit a Pantone color palette of the colors used in the art. Note: Manufacturers that also produce flags use a printing process that can produce many colors so they do not limit the number of colors or require a Pantone color palette. 5. Make sure that you attach your contact information to each file you send for licensing consideration. Below are links to manufacturers that license art for rugs and mats. Note: In some cases, I am not absolutely sure they license art and may instead buy the art. I did not have time to contact the companies but decided that they probably do license art when I recognized a variety of artists names who do license their art. 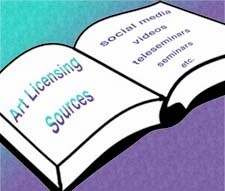 There are many ways to learn about art licensing via blogs/websites, joining licensing forums, attending seminars at licensing shows and by listening to Teleseminars, youtube.com videos, and licensing seminar videos. A list of blogs and websites with free information about licensing are on the sidebar under "Licensing Info. - blogs & website" on my blog. By joining the social media sites Facebook and LinkedIn you can belong to licensing groups and be able to ask questions and read comments made by artists, agents and manufacturers. Facebook has "Art of Licensing" and "Surtex (Before and after the Show) groups that discuss licensing. LinkedIn has "Art of Licensing", "Greeting Card, Stationery & Gift Industry Gurus", and more groups that discuss licensing. Note: Audio downloads of previous "Ask J'net Q&A" sessions can be purchased. Note: Some audio downloads of previous "Ask Calls" are free while others need to be purchased. – All Art Licensing classes with art licensing coach Jeanette Smith and other art licensing experts. The classes are via live audio and downloadable PowerPoint presentations. They include free downloads of audio and PowerPoint pdf format presentations. Note: Audio and PowerPoint presentation of previous classes can be purchased. – ArtLiceningInfo.com Teleseminars with artist Tara Reed and other art licensing experts. The teleseminars are via live audio and downloadable PowerPoint presentations and include free downloads of audio and PowerPoint pdf format presentations. Note: Audio and PowerPoint presentation of previous classes can be purchased. Also, e-books on various aspect of art licensing can also be purchased. The conferences given by licensing experts at SURTEX are a great way to learn many aspects of the art licensing industry. The 2013 conference had sessions that appealed not only to those new to licensing but to those that have been licensing their work for years. And for the first time, SURTEX videotaped the 1-1/2 hour of eight sessions and offer for sale the links to watch them. Links and passwords can be purchased for $40 per conference session with a discounted price of $110 when purchasing a track of four sessions; $195 for all eight sessions. Note: I purchased Track II seminars and found the video taping excellent. The information on them are invaluable and worth the price although I was disappointed that the taping of two of the seminars ("Safeguarding Artwork – from Copyrights to Internet Protection" and "Category Spotlight: Textiles & Home Fashion") were cut short and only 45 minutes long. Below is a list of the conferences. Note: A very impressive list of licensing experts volunteered their time to share their knowledge about art licensing! More information about each conference and purchasing the link and the password are given on the SURTEX 2013 Conference Program page.